Nowadays lots of people and companies want to innovate. They want to generate new ideas and turn them into profitable products. But how would you separate good ideas from not so ones? How would you make sure you invest only in good ideas? Even before you have an idea - you need a problem. Every good product started with a problem to solve. You recognized someone has a problem? Good. That's your starting point. Next step: validate a problem. Does this problem worth sorting? How do you validate a problem? Urgent - means this problem causes a real pain, right now. Pervasive - means this problem causes pain to a larger group of people. Willing to pay - means this problem is so painful that people are willing to give you money for you to deal with it. Now let's see how it works on a silly example: I have a problem walking with my dog, Boxer, each day. Is it an urgent problem? Well, only for some right? Some people enjoy walking with a dog and therefore have no problem with it. But when an unexpected meeting popped up at the last moment and I can't decline it - that's when this problem becomes urgent. How many people get into those kinds of situations? How often? Answering those questions would let you have an idea about the pervasiveness of this problem. And then, is that such a big problem for me that I actually gonna pay for solving it? Maybe I have good neighbors to whom I can call and ask to take care of Boxer? What if neighbors out of town, well... In this case, I'd probably pay. For a problem to be worth solving it needs to satisfy at least two of three filters. If a problem is urgent, not pervasive but customers are willing to pay for solving it - it's might be a very luxury market segment with an opportunity of high-end pricing. If a problem is urgent, pervasive but customers are not willing to pay for it - you might think about alternative monetization models. If a problem is not urgent, but pervasive and customers are willing to pay something for solving it - your experience should be so pleasurable and easy that customers motivation does not need to be high. You need to invest time and effort to guide your problem through that filter but it will greatly pay off in the future. You will not loose time on problems that are not worth to be solved. With ideas, we have the same problem. What are good ideas and what are not so? If only there was a filter for that. Guess what, it exists. Valuable - means it solves the real problem, removes real pain, improve the life of a business or/and an individual. Usable - means it is easy and pleasurable to use. Feasible - means you can build it. Taking the dog walk example from above, let say my product idea is a robot that would walk a dog instead of me. Is it valuable? Yes, if it works. It solves my problem: when I can't walk with my dog I send a command to the robot and it does it for me. Boxer is happy so as I am. Is it usable? Well, I have an app on my phone, there is only one button "walk my dog". And then I could see through the built-in camera how and where they are walking. It's easy and even fun. Is it feasible? Oh yeah, we can build it! Only it would take us 3 years and would probably cost millions. Oops. Still was worth a shot. Sorry Boxer. By applying those simple filters, first to your problem statement and then to the solution ideas you can dramatically decrease time and money wasting on problems that are not worth solving and ideas that nobody would use. 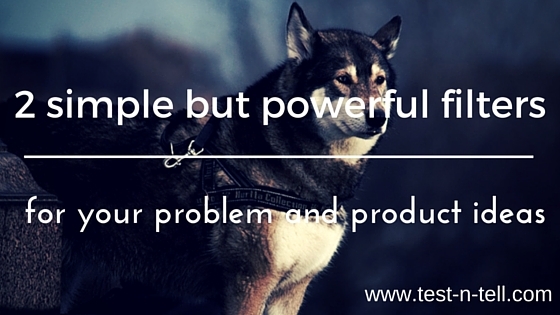 Do You Have A Problem Worth Solving?